Having the ability to digitally print and convert ultra thin film media gives converters the opportunity of serving the growing trend towards linerless labels. In recent years the market has recognised the benefits of digital linerless labels. Not only do they reduce packaging waste through the supply chain but also can offer light weight alternatives to cardboard sleeves providing more labels per roll – ideal for high volume, high speed and automated packaging lines. Some substrates even match the material of the container they are applied to reducing mixed material recycling, others are bio degradable or even compostable. Brand owners are seeing an increasing requirement to run continuous promotional campaigns, produce seasonal and regional variants and respond to markets more dynamically, forcing converters to provide smaller more frequent print runs. With more information required on labels the possibility of printing on both sides of the substrate is also very attractive to brands. To meet these opportunities, producing digital linerless labels on a hybrid digital production system becomes essential. 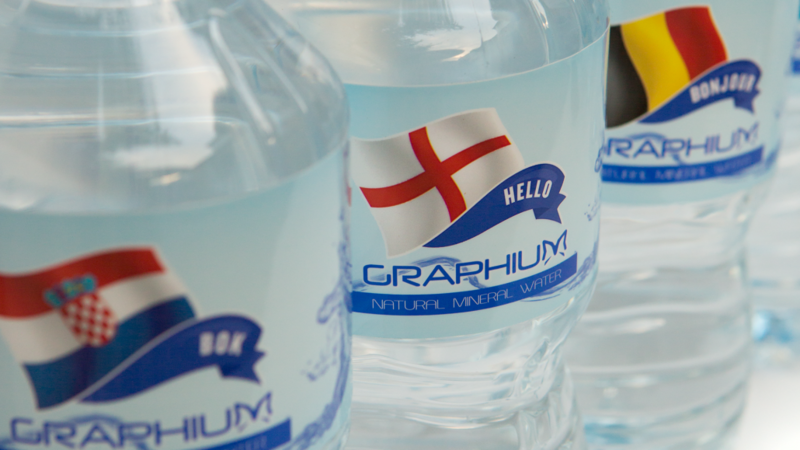 The Graphium hybrid digital inkjet press can be customised to meet the exact requirements needed for producing finished digital linerless labels. Without the right technology ultra thin films can be highly problematic to convert. They are delicate and prone to stretching due to tension and heat from curing lamps – web wrinkles, bagginess, corrugations can make printing challenging. They often require very low operating tensions and driven chilled rollers to prevent distortion during curing. Lamination and rewinding quality plays a critical role in how the label performs during application. Curling and delimitation issues must be eliminated by relating tension between substrate and laminate. Rewind tension must be consistent. Provides perfect digital to flexo registration with thin films. This larger, low inertia carbon fibre encoder ensures quick response to any thin film substrate movement. Graphium’s dynamic sync technology ensures a perfect fit between digital and flexo produced graphic elements, on a range of media. Graphium tracks pre-printed sync marks and automatically adjusts the digital image to fit flexo print. The dynamic sync technology also manages the issues encountered when pre-printed material changes when put under tension. Prevent wrinkling, tearing, and web-breaks using thin films. These rollers feature a spiral grove which radiates from the centre of the web any creases that appear follow the path of the groove to the edge of the web. Automated inking, impression and registration. AIIR relies on registration marks, which are printed on each station and read by the AVT Helios S camera. The corrections are sent to each print station to automatically control print impression, inking and cross register to ensure the highest print quality. The tension within a reel can often be higher towards the core. Graphium’s closed loop system moderates the tension between the outfield nip and the rewind ensuring the optimum tension is applied consistently through the roll. Accurate colour handling across many substrates. Graphium’s colour management system utilises the best of FFEI and Fujifilm technologies – ISO compliant CMYK, wide gamut spot colour management, ink saving, custom colour spaces and ink limiting for challenging substrates are all possible. In order to prevent migration through setoff, lamination must be achieved inline. Closed loop lamination ensures tension between reel of laminate and the substrate in consistent and a close match. This prevents two different tensions within the laminate itself causing a curling effect. Allow print to be viewed through the substrate. In some non-laminated applications (shrink film or ROSO labels) or where it is preferable to print on a thicker film and laminate an ultra thin film (or number of films), reversing the print order is often required to mirror the print on clear substrates and then print white last. Chilled rollers and LED inter colour curing are standard on Graphium. Chill rollers are absolutely essential when working with heat sensitive filmic substrates. They cool the substrate during the UV curing process ensuring that X, Y distortion is eliminated.